Electronic dog fence containment systems all use a modulated radio signal to transmit through a cable which surrounds a boundary. The receiver collar worn by your dog, picks up this signal and instructs the receiver to activate, letting your dog know that he’s close to the boundary edge using an audible sound from the receiver collar. Since 1990, all regulated, FCC and ACA approved brands of Dog containment systems use a DM (Digital Modulation) transmission to send through the cable around your boundary. Why is the FM v AM important? AM signals are far less secure and have the potential to activate via other sources. This is extremely important as your dog wears a collar that activates based on the information it receives. If an AM based receiver collar worn by your dog picks up a signal that isn’t its own, it can activate and confuse your dog. 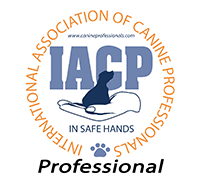 This is an evident welfare issue, as dog training relies on proper association and timing. Read below and discover more about why the DogWatch Hidden fence is the safest choice for a dog fence containment system, and the FM difference! All manufacturers of containment dog fence products (Except DogWatch Hidden Fence) use AM (amplitude modulation) carrier waves. ONLY Hidden Fence brand by DogWatch has the Patent on DM carried by FM. Pulse Amplitude Modulation (PAM) Used by most manufacturers of perimeter fence. Pulse-Duration Modulation (PDM) (Morse Code) Used by one manufacturer. 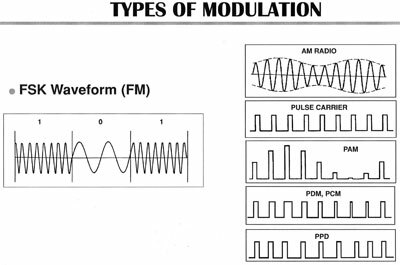 Pulse-Code Modulation (PCM) Used by one manufacturer. FM receivers ignore AM signals. (televisions, Air Con Compressors, motors, etc. emit AM signals). FM receivers can work in electrical noise environment without disruption. Output power remains constant with the amount of modulation. Less risk of receiving partial signal. Eliminates risk of false correction from other sources. If any environmental factors such as Air Conditioning compressors, garage door openers, driveway gates, pool filters, etc are factors on your property, then only an DM-FM Hidden Fence System allows for non-activation of a receiver collar around these utilities. 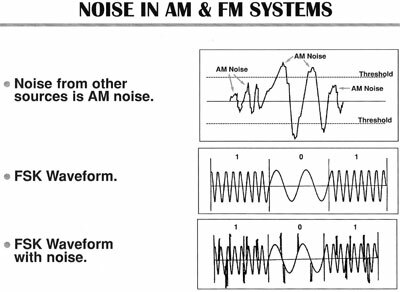 Below are diagrams of what happens to DM-AM wave patterns when experiencing electrical noise (a motor or compressor starting). As seen above, …FM FSK DM wave patterns don’t get disrupted by electrical noise or interference. This is realised when you are listening to a car radio on an FM Radio station and can still hear your program clearly when travelling under a bridge or tunnel; whereas an AM radio station will “blank or phase out” when experiencing the same conditions. Only Hidden Fence brand by DogWatch offers you this technology. When dealing with a training tool or behavioural modifier, precision and accuracy is paramount to preserving animal welfare.